Malcolm Tucker has lost his iPhone - and you have found it! 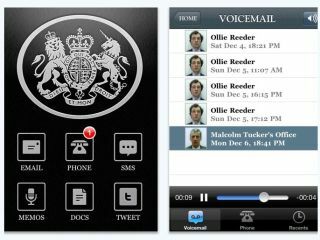 Armando Iannucci's genius political satire The Thick Of It gets its own iPhone app this week in the shape of 'Malcolm Tucker: The Missing Phone' – essentially letting you see the angry spin doctor's darkest secrets. Which, as is Peter Capaldi's character's wont, he is sure to not be very happy about. It seems that angry-man Tucker has lost his iPhone, containing all of 'The Missing DoSAC' files in addition to all of his personal info stored on his mobile phone. The app also lets you read new scripts by Armando Iannucci and co-writers Jesse Armstrong, Simon Blackwell, Tony Roche and Ian Martin. So you can have fun hacking Malcolm Tucker's iPhone messages and reading his private ranting expletive-laden emails while we all await further TV outings of this fantastic show. 'Malcolm Tucker: The Missing Phone' app also features new material from The Thick of It stars Rebecca Front, Chris Addison and Peter Capaldi himself.